48 hours ago this was looking like a straight forward weekend for Mercedes. After impressing in Melbourne you would think a power friendly circuit like Bahrain would suit them perfectly. But it’s Ferrari who have soared in the desert and have managed to keep Mercedes at arms length in every session. 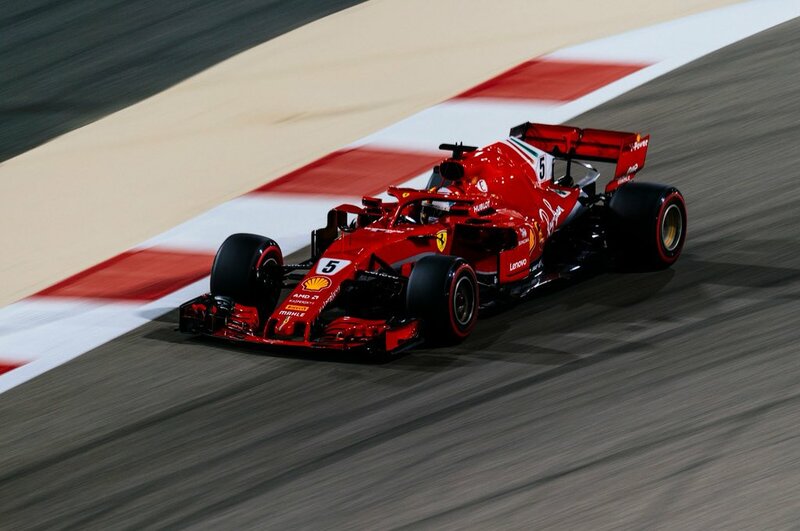 Vettel or Raikkonen have taken top spot in all 3 practice sessions but it was Vettel that managed to produce the lap when it mattered most. He dipped under 1m28s on his last flying lap and Raikkonen was unable to improve on his earlier time. I just hope we see the two Ferrari’s racing tomorrow and not just one helping the other. Bottas outqualified Hamilton to get 3rd and got within 2 hundreths of a second of Raikkonen in second to offer some hope going into race day but the Mercedes car has not looked at home here in Bahrain. Hamilton is having a weekend to forget as a few mistakes have been topped off by a 5 place grid penalty which means the World Champion starts 9th. If anyone can turn that into a podium it’s him but with a far more competitive midfield in 2018 it will be interesting to see how easy it is to get through the pack. Ricciardo will take Hamilton’s place on the second row after qualifying 5th. The Australian was nearly half a second off the polesitter but it’s well known that Red Bull’s race pace is a lot more competitive then their one lap speed which gives him a great chance to grab their first podium and possibly challenge the Ferrari’s for the win. Verstappen on the other hand had a qualifying to forget as he spun off into the wall in Q1. Luckily he had a time on the board meaning he will start 15th which should again add some further excitement to the midfield. The best lap of qualifying has to go to Pierre Gasly in the Toro Rosso as he snatches some of the limelight from Vettel and Ferrari. Gasly managed to get his Honda powered car in 6th only behind the Ferrari, Mercedes and Red Bull and with Hamilton’s grid penalty he moves up to 5th for the race tomorrow. While Honda impress McLaren disappoint as they failed to get either car into Q1. After a double points finish in Melbourne they were hoping for more of the same with talk of starting to apply pressure to the big 3. In reality they have gone backwards and are nowhere near Red Bull who run the same engines. Alonso and Vandoorne start 13th and 14th respectively and we’ll see how long it takes Verstappen to shoot past. Haas were set to be the stars in Melbourne until the infamous pit stops ruined their race and the team have not quite managed to stay at that level. There are still very promising signs with Magnussen set to start from 6th but Grosjean went out in Q3 following a mistake on his flying lap And will start 16th. Another challenger for 4th in the constructors championship is Renault who have got both cars into Q3 at both races this season. Another double points finish would be a very positive start to the season and hopefully Carlos can get round without feeling sick. Finally, Ocon made up the top 10 as Force India finally show some much needed improvement. We are only coming up to the second race of the season but I believe we can expect the midfield to change round week after week. We seem to have the big 3, followed by an intense 5 team battle and Williams and Sauber a little off the pack.